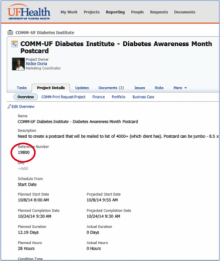 UF Health Communications uses the project management system, WorkFront, to input and manage our workload. Below you will find general guidelines to help you when using the system, as well as our print production timeline to help you understand how long specific projects take from start to finish. Please note: these guidelines contain suggestions specific to UF Health News and Communications. If you are seeking guidelines for UF Health IT, please navigate to the general Support, Training & Guidelines section. SEARCHING THIS PAGE FOR ANSWERS. Simply use your browser’s “Find” function to search for keywords on this page. This will help you find quick answers to your questions. In general, you will create a project in Workfront for design projects, articles and press releases, website updates and/or creating web subsites. If you are new to UF Health Communications and need to establish a Workfront account, please contact Greg Turner or Terri Carpenter, who are a Workfront System Administrators. You will receive instructions on how to set up your account, and a Workfront System Administrator will assign you appropriate permissions. Once your account has been established, you will need to take the following basic training courses on how the system functions. Go to support.workfront.com and login (domain is UFHealth). Select the Help tab at the top (if it is not already selected) and then select Training near the top left. Team Member – this is a 2-hour course that provides a general overview of Workfront functionality as needed by team members. The course covers basic navigation, managing work assignments, handling issues and managing documents. Work Management (Part 1) – this is a 3-hour course that provides instruction on how to establish and manage projects. 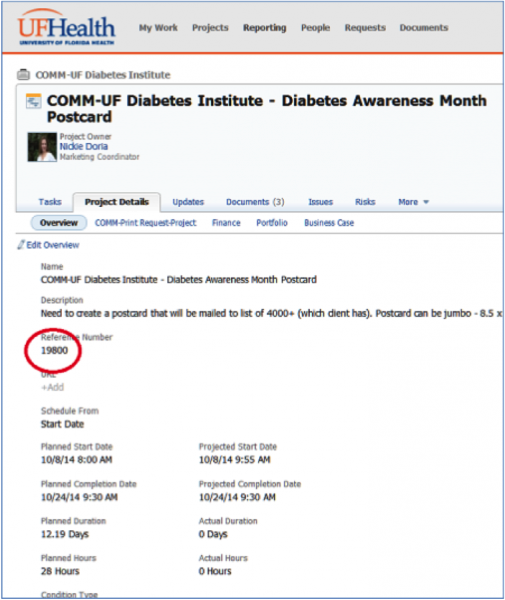 Each UF Health Communications team should have one or more designated Workfront trainers. Once you have completed the basic training above, you will need to meet with your team’s trainer to review how your particular team utilizes the system. While your trainer will walk you through how your team uses the system, some general tips and tricks apply to all team members. We have listed them below as a resource to you. A task is completed and is ready to move to the next project task. Whenever an individual or team of individuals are assigned tasks in a project. If multiple tasks are delegated to an individual at the point of initial project entry, then that individual will be notified of all the tasks for which they’re assigned as soon as that project is made current. We have created several different types of templates from which to choose in order to begin a project. The fundamental theory behind our project templates is that we threw in the “kitchen sink,” meaning we put in every possible task that could be associated with a particular project, then assessed the maximum time it should take to complete each task. You may “customize” the templates to fit your specific project needs by adding or deleting tasks, reassigning job assignments, changing task durations and changing predecessors, however, PLEASE stay within the appropriate production timelines. If you have a project that is more urgent, please follow the instructions below about accelerated projects. If over time, you keep customizing the same template the same way, perhaps we should build you a new, unique template. To do so, please contact Greg Turner or Terri Carpenter. The Creative services team meets on M, W, F from 9:20 – 9:40am to triage new projects. The print production timeline (below) outlines the steps and duration of each step in the design and production process. It is important when choosing a category template for your project that you choose the category that best suits your project’s scope of work. If your project has an accelerated timeline, you should still choose the correct category based on project scope, but change the dates of your tasks to accurately reflect your timeline. Please call Garrett or Selena to inform them of your immediate need. Doing this will allow us to review your submitted project ahead of triage to avoid delay. Please place your rational for rush need in the project details OR updates prior to being submitted to Creative Services for triage. Including this information helps us keep track of the frequency of rush projects as well as keep all parties informed. Accurate project categories are vital not only because they help populate accurate timelines but because they also help with accurate year-end reporting to leadership. Accurate category selection allows Creative Services to show how much time, how many projects, and how many people were dedicated to each level category through the year. We encourage you to enter a project as a single and unique entry (whether or not it is tied to a larger campaign), using a single unique template. You can name individual projects tied to a larger campaign with the same wording to show how they are related or tied together. You must also tag them with the same portfolio, client and program options, which will group them together when reporting or searching. More on how to do this below. When entering projects for design, the first creative task is “Layout first draft”. While still in the Planning phase of the project, please copy the title of the project and paste it into this task (after “Layout first draft”). “Layout first draft” will automatically assign “Graphic Design” to the task. Once the project is made Current, this task will notify Garrett Hall, Selena Carter and Bonnie Blair that the project is ready so that they can determine which team member will be assigned to that project. They will then remove “Graphic Design” from the first design task and replace it with the designer who is assigned to your project. Garrett, Selena and Bonnie WILL NOT assign the designer chosen to any subsequent design tasks in the project and neither should you UNTIL that task is ready for that person to work on. You may want to fill in the designer on all these tasks as soon as you know who is assigned to your project; however please do not. When you have completed the edit/approve task prior and are ready for the designer to work on the next task (“Incorporate draft edits and submit next draft”), you will then fill in the designer’s name, thus assigning them that individual task. You will need to remove the assignee “Graphic Designer” from that task and replace it with the designer’s name. If you fill in his or her name on all design tasks once you know whom the designer is, notifications are triggered to him/her even though the tasks are not ready to be worked on. The Creative Services team manages their work queue at a task level and views each designer’s current task load using dashboards and reports to assess their availability to receive new projects. If a designer is assigned to tasks that are not yet ready to be worked on, it skews their ability to assess each designer’s workload accurately and can cause confusion, hindering workflow and equitable triage for the Creative Services team. Use underscores to separate each part that describes your project: “Entity_Department/Client_Project Title_Type of Project_Date (Optional)”. Limit any symbols in your project name to only underscores. Designers typically copy and paste your title into the project/folder file name for archiving. Some operating systems reject certain symbols (&, @, etc.) in file names. It’s not important whether your projects contain en or em dashes or hyphens. Simple dashes work just fine, as do en or em dashes. If the project is not for a specific department, you don’t have to include it in the name. It is fine to add dates into your project title at the end of the name if you’d like. 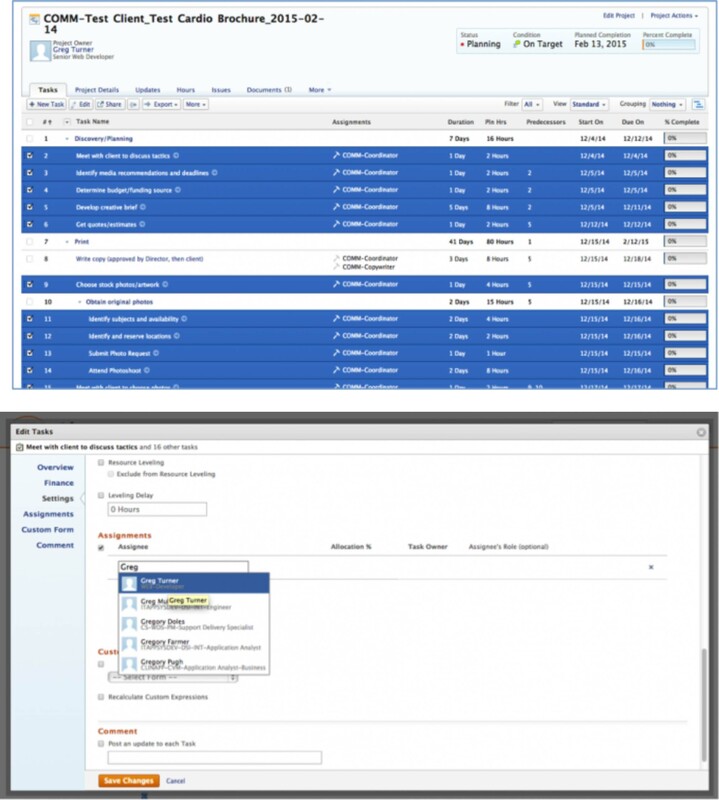 Workfront will generate a project number for each project entered, which is found in the project details tab. The red circled number above is the project number you should use when referencing a previous job for which your current job will be based. It is also the number we will use in naming the folder on the CSIM drive when archiving the native files/assets for your job. Your job’s folder will be archived on the CSIM drive first in the year it was done, then by Project Number and Name. COMM-UF Health_OBGYN_2015 Fertility Conference_Flier.doc. Subsequent versions of your Word document that you will route to members of your review and approval team should be named with the reviewer’s initials at the end of the final name, as per #3 below. When the Word document is ready for design and layout — meaning ALL approvals have been obtained from the various reviewers — please upload the FINAL document using this naming convention COMM-UF Health_OBGYN_2015 Fertility Conference_Flier _Final.doc ( or _F.doc) so your designer knows exactly which document to use for layout, as indicated by the word Final. *NOTE: If the designer does not see your final document labeled correctly, he or she will assume that your project is not ready for layout. Also, if your copy has not been approved by all parties, please do not mark the Copy task complete (which triggers the designer to begin layout). When layout begins, the designer flows the copy into the design. When there are significant copy edits after the initial layout is complete, many times the designer must reflow the entire copy and redesign certain elements, which is time-consuming and double work. And no one likes double work! Design files (proofs) will be uploaded as follows: 12345_COMM-UF Health_OBGYN_2015 Fertility Conference_Flier _v1.pdf. The lower-case v indicates version, or proof. When you make edits to a proof, please upload that proof back to Workfront with the same version number, but add your initials to the end of the file name. For example: 12345_COMM-UF Health_OBGYN_2015 Fertility Conference_Flier _v1_TT.pdf. When your project is officially approved and ready for press, you will assign the “Send assets to printer” task to your designer and he/she will send the final, high-res files to the printer. The final file will be named as such: 12345_COMM-UF Health_OBGYN_2015FertilityConference_Flier _FHR.pdf. The upper case FHR indicates that this is a FINAL HIGH RES file and will be archived in the project folder on the CSIM drive. This file WILL NOT be automatically uploaded into Workfront due to the large file size and need to conserve server space. If you would like the FHR files uploaded to Workfront (if size allows) or emailed to you directly, allowing you to send the files to the printer instead of the designer, please change the wording of the “Send assets to printer” task to read “Send assets to coordinator”. Please also make a note in Updates to indicate to the designer whether or not you need the file to have crop marks or not. If you want the designer to send the FHR files to the printer, but ALSO want these files uploaded or emailed to you, please add an additional task for the designer to send you the FHR files. After the “Send files to printer (or coordinator)” task has been completed, the next task you’ll see is “Upload final, low-res file”. You will assign this to your designer and he/she will upload a final, low-res file of the completed project into Workfront documents. The file will be named 12345_COMM-UF Health_OBGYN_2015FertilityConference_Flier _FLR.pdf. The upper case FLR indicates that this is a FINAL LOW RES file. This document will serve as the final, approved file for archiving and reporting purposes, but should not be used for printing. The rule of thumb is to always provide your edits by marking them in a PDF and uploading it with the version name and your initials. Even if you have a minor punctuation or single-word change, we ask that you mark it in the PDF and upload the revised file. While this may seem cumbersome, it not only helps track changes but also helps the creative services team correctly make all of your edits. If changes are noted in the Updates section instead of a PDF, oftentimes they can be too vague to interpret correctly. To keep things consistent and as accurate as possible, please follow this rule of thumb as much as possible. We understand that in certain circumstances, you may stray from this which is acceptable as long as you and your designer have discussed it and agree on the best approach. If the initial design of your project has been completed, but you find that you have substantial changes to the body copy a proof, we ask that you submit a new, revised Word document using the above naming convention. Please note that edits require 2 days or 48 hours for turnaround. Because Workfront does not determine the due date based on the time you submit your project, you will need to manually assess the completion date to reflect the full 48 hours. If you have additional rounds of edits beyond the two provided in our templates, you must ADD a task and assign your designer to that task (when it is ready). Please do not put the additional edit in an Update or a PDF without adding another task. Again, the Creative Services team manages their work queue at a task level and should be notified via a task when another round of edits is needed. When this task is added, please give the designer 2 days to complete the task. If it is a very small change that you need more quickly than 2 days, please CALL your designer and ask for a quicker turnaround. It may seem strange that a very small change should be given 2 days, or 48 hours, to be completed, but each designer works on many projects simultaneously. When you provide your edits, he or she has most likely moved on to another project that could be very time-intensive and require a lot of focus. The 2 days gives the designer the ability to work the edit into his or her current schedule and project workload without interfering with other projects that have already begun. If the designer has missed an edit or done your edits incorrectly, the standard 2 days for an edit does not apply. Best practice in this case is to call the designer, explain what was missed and asked if they can correct it that day. Once the designer receives this request and information, he or she will pull the final print ready file and send it along to the printer. It is not necessary to begin a new Workfront job for a reprint. Image preferences: ethnicity, age, tone, attitude? Brief statement of the goal of the piece. If you’ve completed a created brief, that should cover it, but if not, include it in the project description. Is the project part of a broader campaign, and/or does it need to relate to other products? Should crop marks be included for vendor? *These items are the most often missed or not filled in at all. If you are entering a project and know the designer will be sending the files to the printer, please complete the Billing information, Cost Center (if there is one) and where the final printed items will be shipped. This will avoid these questions having to be asked when the final proof is approved and ultimately prolonging the files being sent to print. **If your project requires a certain file type, or you will be printing it yourself with a laser printer, please let the designer know ahead of time so that he/she knows how to properly output your final file. Completion is the date the project is officially closed. Please bear in mind that your template may have several days of “closing tasks” AFTER your products are delivered or your event is held. To schedule from Completion date, select Schedule From -> Completion in your project entry form. Use the pop-up calendar to select the project’s due date, or input the date manually. As you’re entering a new project, please keep its status as “Planning” until you have correctly entered all appropriate job roles/individuals, deleted or added tasks, changed any predecessors, and changed any durations. This way, notifications won’t accidentally trigger to the wrong people. Once your project data is accurate, change its status to “Current” so that it becomes a live project. It will then trigger all the appropriate notifications. Portfolios, clients and programs are used for tagging your projects so that they are discoverable when searching and reporting. In general, remember that the more items with which you tag your projects, the better. The rule is to overtag rather than undertag. When selecting a portfolio for your project entry, please select the highest-ranking, or most overarching entity/facility, for your project. You can only select one item from the portfolio list. Use the “Additional Clients” drop down to select as many additional tags for your project as appropriate. You may multi-select items from this list. 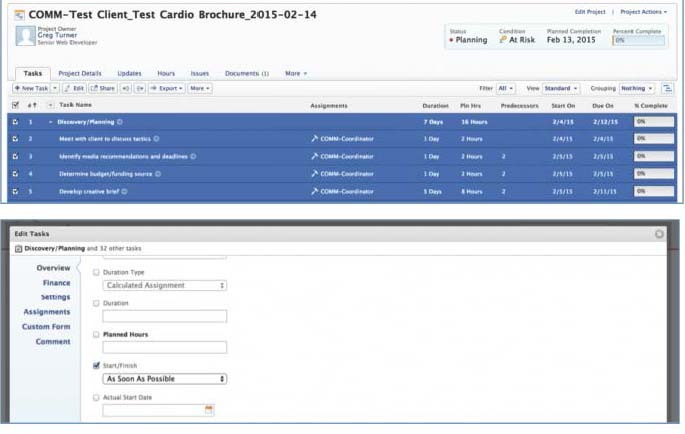 Teams may generate programs to attach to portfolio items at their discretion. A program example might be: “2015 New Tower Groundbreaking Event”. Tasks are a project’s “to do” items. Assignments are associated with each task and list the person who is responsible for completing that task. Duration and hours are the length of time (in days, weeks, hours) that each task and person assigned to that task has to complete it. Predecessors establish the order in which tasks should be triggered. For instance, Task 3 cannot be completed (and will not be triggered to be completed) until Task 2 is complete if it is set with a predecessor with the number 2. Please note that not all tasks have or need predecessors. Our templates have built-in predecessors, but you must be familiar with how they work and how to change them, especially if you are adding and deleting tasks from a template. The basic training courses you took should provide a good overview of these terms and how they function. However, the most valuable ways to learn include meeting with your team’s trainer and practicing using the system. Remember, as long as your project is still in the Planning phase, it is not live. You can use this time to “play around” with the system and these items. You can also create “Test” projects to practice what happens when a project is marked Current; however, please inform anyone assigned in the project that you are doing this and please also make sure the word TEST is in the project title. Much of your functionality in Workfront depends on the permissions assigned to you when you created your new account. Permissions essentially allow you to see or not see certain things, as well as avail you or not avail you to certain functionality. If you are not seeing things you think you should be seeing (and that your colleagues ARE seeing) let the system admins know and we can look into resetting your permissions to ensure they’re accurate. First, select the task you wish to assign yourself. To select multiple tasks on the list, click on the first item, hold down the shift key, and click on the last task. To select the next batch, click in the box next to the task, hold down shift, and click on the last item in the batch. scroll up and click the “edit” button. Scroll down to Assignments and input yourself as the assignee. Note: You will need to individually update all tasks assigned to more than one job role. Also, any task assigned to a graphic designer should be assigned as they are ready to work on each task, not all at once. 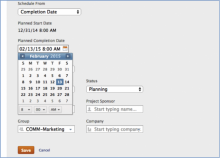 After your project is created (and still in planning), check to make sure the dates all fall in sequence. If you notice they don’t, you may want to bulk edit the Start/Finish setting. If your predecessors are correct, this should cascade through each task and correct any issues with start/finish dates. If this doesn’t seem to be working, check your completion date. If you have adjusted durations that would put the entire project PAST your slated completion date, the system will not adjust/update dates correctly (it REALLY wants you to complete your project on time!). You will need to go into Edit Project and adjust the completion date to a later time and then go through the start/finish process again. If this still doesn’t work, there may be a technical issue and you will need to contact one of the system admins. Please attach all documents at the project level (NOT the task level). All documents can be seen here in reverse chronological order. Please keep in mind that it is vital we name documents and project assets according to our naming guidelines to avoid confusion with versions and approvals, as there can be many different types of documents, versions, etc. uploaded to a project. There are many different areas within a project in which you can leave a comment or update, for instance at the project level, task level, even the document level. We ask that you please put all comments at the Project Level. This will help ensure that the person it is directed to can always find it. If it is noted at a task level or document level and someone needs to reference it back, it can sometimes be difficult to find. It can also be difficult to find if you do not tag the person you are sending the comment to! Be sure to tag a person when sending them a comment, otherwise they won’t see it. Click on the “Include others on this update” in Updates Tab to make sure everyone you want to see the update is included. Select document, then under the “More” drop down menu, select Delete. If after following these directions, you do not have the option please submit an ISSUE with Greg Turner or Terri Carpenter in Workfront to address your permissions. The built-in calendar just reflects the projected due date that Workfront assigns. There are currently technical issues being worked out that may cause problems to your calendar function. If you have assigned yourself a task, or anyone else, and they accept, it populates their calendar with the projected due date. However, if you go back and update that date AFTER they have accepted it, the date does not adjust/update in their calendar. Please note that we are working on this issue, but at this time, you may want to avoid using your calendar as a working queue. The normal approval process designated to Print Project Categories 1, 2, 3 and 4 provides Stacy with 2 days, Wanda with 2 days, Melanie with 2 days and 4 days are given to Executive Approval (UFP and legal) to review and approval for a total of 10 days for all approval tasks to be complete. If you need an accelerated timeline, a four-day approval can be used in the template or you may change the dates manually, however, please ensure that your manager is aware of the rush approval and has approved. Due to the extensive nature of Print Project Category 5, additional days are given to each approval task. For a Category 5, Stacy, Melanie and Wanda are given 4 days for review and Executive Approval is given 6 days, totally 18 days for all approval tasks to be complete. Simply use the built-in New Project form, or use the (+) on MY Work > Working On tab. This is an ad hoc task generator. You can log time in this function. We have created a discussion forum within UF Health Communications Bridge internal website called Workfront Discussion Forum. Use this space as a question/answer forum with your colleagues to talk about best practices, process and workflow, not as a place to submit issues that need a technical fix. Use the “Technical Glitches” information below for bugs that need a technical fix. 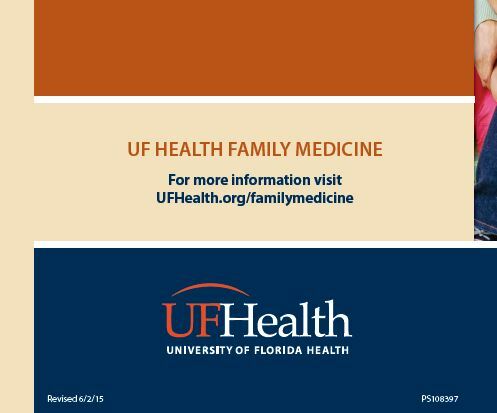 The Bridge website also houses a document with helpful links for not only Workfront, but also for UF Health Communications in general. Workfront is available on mobile and tablet devices and via the Workfront app. Note: Generally, you cannot upload documents to your project using a mobile device. Please work with Greg Turner or Terri Carpenter, who are our Workfront system admins. They hold the key to the system. Fill out the generated form, and your issue will be logged. PLEASE MAKE SURE TO TAG GREG IN YOUR ISSUE. To help create an easily referenceable set of collateral materials for UF Health, each rack card, brochure and flyer should have a printed code that appears on the bottom right side of each piece. 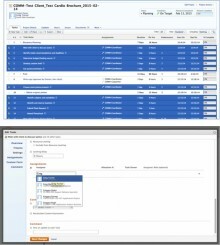 These codes will help any UF Health staff member find the original project using our Workfront project management system. There are three types of coding systems based on the department or team who produced the piece. The project number used by the creative services team is the Workfront project number located in the project details area of its Workfront job. The project number used by Publication Services is a project number based on their local filing system. Although the project number used is not a Workfront project number, Publication Services submits proofs through Workfront, and each of those proofs has this same number in the file name. A quick search of this number in Workfront will bring any staff member to the exact job referenced. Projects that are produced using our Renaissance Template Repository will be coded using RR to indicate the that original files are saved in the Renaissance database. Any staff member with access to this repository can be given access to see certain projects, edit, reprint, etc. The job number used is the Workfront project number located in the project details of the Workfront job. For these projects, reprints and edits are handled by the staff member. The project manager must forward the project job number from Workfront to the TJ team to include on products. The project manager must forward the project job number from Workfront to the freelancer to include on products. Reprints of projects that have had edits should include a revision date to the left of the project code or in the lower left corner of the piece (if space allows) using the same specs as the code. Creative Services and Publication Services designers, and department administrators Connie and Karen are the only ones allowed to generate proofs. For marketing freelance projects, Connie/Karen will generate the proof, and will add a task for creative director (Selena) to review as the first step in the approval process. She would have the same amount of time to review as the division leaders would. College reps would work with Selena to generate the proof for freelance files. For now, all projects EXCEPT multi-page publications should use the proofing tool. Staff who have difficulty with the proofing tool once we launch it can call their WorkFront expert/ambassador for support and training. It does require Adobe Flash. Be sure to save each individual comment in a proof to ensure not losing any comments. The purpose of the print production timeline is to give you a realistic perspective of the amount of time it will take to complete your design job, as well as the steps in the process. In some cases, legal review, printing or mailing won’t be necessary, which will save time. This timeline is the result of years of experience. We often hear, “You mean it will take 21 business days to produce my invitation? That’s ridiculous! I could throw it together in 5 minutes in Word at my desk!” While it’s true, it likely won’t look professional, and you’ll still have to submit it for review and approval. Remember, the timeline reflects more than just the design work. At any given time, our designers may have 30-50 design jobs in the queue, which is why it’s critical we adhere to the timeline and manage expectations. And everyone’s job is a high priority! Please use the timeline to plan out your project. Click on the Production Timeline image to the right. You’ll be redirected to an Adobe site where the Timeline will display in full.